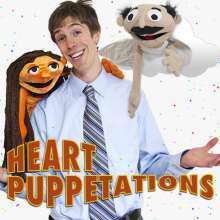 SDT Production’s Heart Puppetations had a large theater to fill at this year’s Toronto Fringe Festival. For a Saturday afternoon show, they attracted a diverse crowd. But for me, their earnest romantic comedy about a man who creates a perfect puppet woman, failed to make the most of the space. In terms of my experience with puppetry, I’ve seen children’s puppet shows and I’ve seen a touring production of Avenue Q. I chose Heart Puppetations in the hopes of seeing something different. What I saw was a cross between the two, and in my opinion, this middle ground didn’t really offer anything new or exciting. When Sandy’s (Sandy Gibson) girlfriend Rachel dumps him, he wishes his beloved new puppet were real. But when Rose (Miriam Drysdale) starts talking and moving on her own, she remains a puppet and definitely not Sandy’s ideal dream girl. Sandy Gibson and Miriam Drysdale sang passionately during the musical numbers, but until the final song, I saw no reason for them to tell the story through music. Though they demonstrated decent vocal ranges, the sound never swelled to fill the Randolph auditorium. Plus, I must admit that after seeing shows with live bands, the pre-recorded original score felt quiet and flat. The characters were earnest and charming, and I wanted to love them at the beginning. I couldn’t help but smile at Sandy’s (Sandy Gibson) pathetic yet genuine attempts to woo his ex-girlfriend and puppet dream girl Rose. When Matt Chisholm was on stage as either Boo Boo, the inept fairy godfather, or Sandy’s Pokemon-obsessed older brother Matt, I could not watch anyone else; his facial expressions created a compelling stage presence whether or not he was operating the puppet. Ultimately, the story they told was predictable, and the dialogue felt self-indulgent. I couldn’t feel for Sandy’s plight for love or Rose’s fight to be her own person, er, puppet. Heart Puppetations worked best when it parodied itself for taking puppetry too seriously, and trying to replicate as much of Avenue Q’s big musical structure as possible. Though it didn’t take big enough risks for me, it does present a clear Pygmalion-esque story with puppets, which will be appealing to some. Many other audience members seemed to laugh along and I hope that Heart Puppetations continues to find its audiences and grow into its theatre. Tickets can be purchased online, by phone (416-966-1062), from the festival box office down Honest Ed’s Alley (581 Bloor West), or from the venue box office starting one hour before the peformance. Venue sales are cash-only. Photo of Sandy Gibson by Natalie Novak.